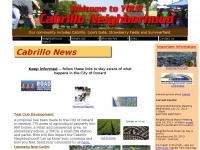 The Cabrillo Neighborhood Council is a certified, elected neighborhood council in the City of Oxnard, California. 7. Sep­tem­ber 2010 Mee­ting Pho­tos /gal­le­ries/watchpat­rolmee­tingseptem­ber222010/album.. The web server used by Cabrilloneighborhood.net is located near the city of Burlington, USA and is run by The Endurance International Group. 22 other websites are located on this web server. Most of them are provided in the english language. The websites of Cabrilloneighborhood.net are served by a Apache server. The markup language of the website is HTML 4.01 Transitional. Both the inclusion of the website in search engines and follwoing of its hyperlinks is explicitly allowed.